Ever wonder why your ancestors suddenly left an area and moved to a distant region? Or, why did they return to the same area that they originally came from? If you had family who lived in the States of Kansas, Nebraska, North and South Dakota, Colorado, Oklahoma, Texas or the western portions of Iowa, Missouri, or Minnesota in the mid 1870’s, chances are they were witnesses of the devastating plagues of locusts that swept over the region. Lush gardens and fields of a wide range of crops were reduced to a barren, desert like appearance within a matter of hours. Crops that were needed to sustain a family and their farm animals were destroyed leaving no means of support during the coming winter. As early as records are available, the central region of the United States has had occasional times when locusts would increase in number and quickly devour crops over a large region. None of the previous invasions were nearly as devastating as what would become known as The Year of The Locust: 1875. Nothing like it in the United States had been recorded before and nothing like it has been seen since. What could cause such devastation and panic? The answer is a relatively small flying grasshopper, roughly 1.25 to 1.4 inches long, known as the Rocky Mountain Locust. Individually, they were rather unimpressive and caused little problem. When conditions were ideal, they could multiply into the billions, travel over long distances, and consume virtually anything and everything that was remotely edible. 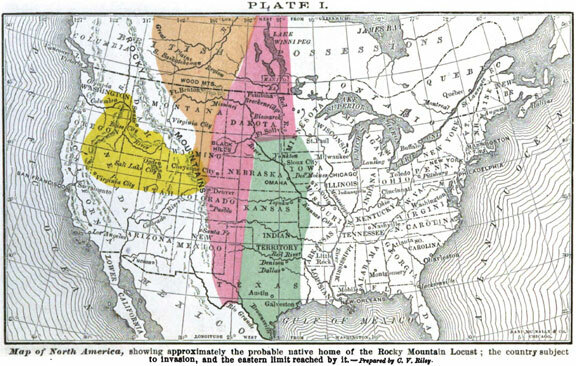 Their native homelands were the dry Rocky Mountain upland region of primarily Colorado, Wyoming and Montana. After hatching out in the spring of the year, the locusts would travel eastward in search of food. In years where the number of those hatched was unusually large, the food supply was stripped rather quickly driving them ever eastward in search of new food supplies. Kansas and Nebraska were usually among their first targets and were frequently the most devastated but the swarms spread over a large area stretching north from the interior of Canada and extending all the way to the south border of Texas. The eastern regions of Nebraska and Kansas along with the western regions of Minnesota, Iowa, and Missouri were the areas most devastated. “The vastness of the depredations of the insect are better appreciated when it is stated that the locust area comprised nearly two million square miles, and that Missouri suffered on an average with the other states within that section. It is estimated that the aggregate loss in the destruction of crops alone would reach $100,000,000, and that the indirect stoppage in business, and the crushing of new enterprises made fully as much more, so that direct and indirect loss was not less than $200,000,000. Mr. F. V. Hayden, U. S. geologist, in this connection says: "In addition to all this, we must include as a part of the effect of locust injuries, the checking of immigration, and the depreciation in the value of lands. So depressing, in fact, was this result in some regions as to paralyze trade, put a stop to all new enterprises, and dishearten the communities where the suffering was greatest." The History of Lafayette County, Missouri. 1881, Missouri Historical Company, St. Louis, MO. "Their flight, may be likened to an immense snow-storm, extending from the ground to a height at which our visual organs perceive them only as minute, darting scintillations, leaving the imagination to picture them indefinite distances beyond. 'When on the highest peaks of the Snowy Range, fourteen or fifteen thousand feet above the sea, I have seen them filling the air as much higher as they could be distinguished with a good field-glass. It is a vast cloud of animated specks, glittering against the sun. 0n the horizon they often appear as a dust tornado, riding upon the wind like an ominous hail-storm, eddying and whirling about like the wild, dead leaves in an autumn storm, and finally sweeping up to and past you, with a power that is irresistible. They move mainly with the wind, and when there is no wind they whirl about in the air like swarming bees. If a passing swarm suddenly meets with a change in the atmosphere, 'such as the approach of a thunderstorm or gale of wind, they came down precipitately, seeming to fold their wings, and fall by the force of gravity, thousands being killed by the fall if it is upon stone or other hard surface.'" "An idea of the vast numbers that will sometimes descend to the ground may be formed by the following occurrence, related to us by an intelligent and reliable eye-witness, Mr. H. McAllister, of Colorado Springs, Colo.: In 1875, early in August, a swarm suddenly come down at that place. The insects came with the wind, and alighted in a rain. The ground was literally covered two and three inches deep, and glittered "as a new dollar" with the active multitude. In rising, the next day, by a common impulse, their wings would get entangled, and they would drop to the ground again in a matted mass. "In alighting, they circle in myriads about you, beating against everything animate or inanimate, driving into open doors and windows, heaping about your feet and around your buildings, their jaws constantly at work biting and testing all things in seeking what they can devour. In the midst of the incessant buzz and noise which such a fight produces, in face of the unavoidable destruction everywhere going on, one is bewildered and awed at the collective power of the ravaging host, which calls to mind so forcibly the plagues of Egypt." "The noise their myriad jaws make when engaged in their work of destruction can be realized by any one who has 'fought' a prairie fire or heard the flames passing along before a brisk wind-the low crackling and rasping; the general effect of the two sounds is very much the same." "Persons in the East have often smiled incredulously at our statements that the locusts often impeded the trains on the western railroads. Yet such was by no means an infrequent occurrence in 1874 and 1875-the insects pawing over the track or basking thereon so numerously that the oil from their crushed bodies reduced the traction so as to actually stop the train, especially on an up-grade." Report of the Commissioner of Agriculture For The Year 1877. Washington, DC 1878. "The severely stricken region, covering an area variously estimated at from 200 to 275 miles from east to west, and from 250 to 350 miles from north to south, and embracing portions of Nebraska, Kansas and Missouri, presented a variety of experience, some portions being comparatively exempt from injury, while others wore an aspect of devastation that changed the verdure of spring into the barrenness of winter." "The tract in which the injury done by the destructive enemy was worst, was confined to the two western tiers of counties in Missouri, and the four tiers of counties in Kansas, bounded by the Missouri river on the east. The greatest damage extended over a strip 25 miles each side of the Missouri river, from Omaha to Kansas City, and then extending south to the southwestern limit of Missouri. About three-quarters of a million of people were to a greater or less extent made sufferers. The experience of different localities was not equal or uniform. Contiguous farms sometimes presented the contrast of abundance and utter want, according to the caprices of the invaders, or according as they hatched in localities favorable to the laying of the eggs. This fact gave rise to contradictory reports, each particular locality generalizing from its own experience. The fact is, however, that over the region described there was a very general devastation, involving the destruction of three-fourth of all field and garden crops. While the injury was greatest in the area defined above, the insects hatched in more or less injurious numbers from Texas to British America-the prevalence of the insects in Manitoba being such that in many parts little or no cultivation was attempted." The Locust Plague in the United States by Charles V. Riley. 1877, Rand, McNally & Co., Chicago. "In 1875, near Lane, Kansas, they crossed the Potawotomie Creek, which is about four rods wide, by millions; while the Big and Little Blues, tributaries of the Missouri, near Independence, the one about 100 feet wide at its mouth, and the other not so wide, were crossed at numerous places by the moving armies, which would march down to the water's edge and commence jumping in, one upon another, till they would pontoon the stream, so as to effect a crossing. Two of these mighty armies also met, one moving east and the other west, on the river-bluff, in the same locality, and each turning their course north and down the bluff, and coming to a perpendicular ledge of rock 25 or 30 feet high, passed over in a sheet apparently 6 or 7 inches thick, and causing a roaring noise similar to a cataract of water." Other historical accounts have recorded that after the crops were devoured, the locusts turned to the trees, consuming the leaves and stripping the bark from the trees. There are some accounts that fence posts, axe handles, cloth, leather stirrups, bridles, and gloves were also chewed and consumed in their never ending search for food. By late June, the locusts had done their worst and vanished as quickly as they had arrived. Most reports state that the swarms took flight in a northwest direction, apparently returning in the direction from which they had originally come. Despite the lateness of the date, the people went to work in hurriedly replanting their gardens and crops with hopes and prayers that the crops would have enough time to mature before winter arrived. Corn was planted as late as July 4th, which is quite late since most corn in Missouri is planted in May to very early June. A typical Missouri summer is hot and dry so early planting is essential to give a reasonable chance of a successful crop. The year of 1875 was not a typical year. The rains were plentiful and the season was longer than usual. The result was record crops that far exceeded the yield of a typical year. Some areas in Missouri actually were able to grow a surplus of crops which were shipped to the hardest hit areas of Kansas and Nebraska. It was a joyous and surprise ending to what was expected to be a time of extended desperation with a bleak winter ahead. While they continued to be destructive, they were always much less so than in 1875. Never again were they as great of a threat as they had been during that memorable year. Then, surprising, they simply disappeared, never to be seen again. The last recorded sighting of the Rocky Mountain Locust was in 1902. Why did they disappear? A number of theories have been proposed but none seem to provide a completely satisfactory answer. One suggestion is that the widespread settlement of the prairie and the resulting plowing that was done may have disrupted the locusts reproductive success since they laid their eggs in the soil. A number of rainy years may have played a role since their greatest reproductive success was when they laid their eggs in dry soil. While many by their own choice did stay through all of the difficulties, others who stayed simply had no choice but to stay, they were too destitute to move on. Others, particularly in Kansas and Nebraska thought it best to cut their losses moved away, mostly east outside of the area affected by the repeated plagues. The plagues, for a time at least, slowed and some areas actually reversed the migration into the most affected prairie region. Do you have ancestors who without explanation moved from the counties in this region in the mid to late 1870’s? There is an excellent chance that the now extinct Rocky Mountain Locust played a significant role in their decision.